Frankincense (also known as olibanum, Hebrew: לבונה‎ [levona], Arabic: اللبان‎ al-libān or Arabic: البخور‎ al-bakhūr) is an aromatic resin used in incense and perfumes, obtained from trees of the genus Boswellia in the family Burseraceae, particularly Boswellia sacra (syn. B. bhaw-dajiana), B. carterii, B. frereana, B. serrata (B. thurifera, Indian frankincense), and B. papyrifera. The word is from Old French franc encens ("high-quality incense"). There are five main species of Boswellia that produce true frankincense. Resin from each of the five is available in various grades, which depend on the time of harvesting. The resin is hand-sorted for quality. A popular folk etymology suggests a connection with the Franks (and often in particular Frankish Crusaders), who reintroduced the spice to Western Europe during the Middle Ages, but the word itself comes from the expression. Frankincense is tapped from the scraggly but hardy trees by striping (slashing the bark) and letting the exuded resin bleed out and harden. The hardened streaks of resin are called tears. Several species and varieties of frankincense trees each produce a slightly different type of resin. Differences in soil and climate create even more diversity of the resin, even within the same species. Boswellia sacra trees are considered unusual for their ability to grow in environments so unforgiving that they sometimes grow out of solid rock. The initial means of attachment to the rock is unknown, but is accomplished by a bulbous disk-like swelling of the trunk. This growth prevents violent storms from detaching the tree. This feature is slight or absent in trees that grow in rocky soil or gravel. The trees start producing resin at about eight to 10 years old. Tapping is done two to three times a year with the final taps producing the best tears due to their higher aromatic terpene, sesquiterpene and diterpene content. Generally speaking, the more opaque resins are the best quality. Fine resin is produced in Somalia, from which the Roman Catholic Church purchases most of its stock. Recent studies indicate that frankincense tree populations are declining, partly due to over-exploitation. Heavily tapped trees produce seeds that germinate at only 16% while seeds of trees that had not been tapped germinate at more than 80%. In addition, burning, grazing, and attacks by the longhorn beetle have reduced the tree population. Conversion (clearing) of frankincense woodlands to agriculture is also a major threat. Frankincense has been traded on the Arabian Peninsula for more than 6,000 years. Frankincense was one of the consecrated incenses (ha-ketoret) described in the Torah and Talmud used in ketoret ceremonies, an important component of the services in the Temple in Jerusalem. It was offered on a specialized incense altar in the time when the Tabernacle was located in the First and Second Temples. It is mentioned in the Book of Exodus 30:34, which calls it לבונה (levona; Biblical Hebrew: lebonah), similar to לבן‎, lavan, 'white'. It was one of the ingredients in the perfume of the sanctuary (Exodus 30:34), and was used as an accompaniment of the meal-offering (Leviticus 2:1, 2:16, 6:15, 24:7). It was also mentioned as a commodity in trade from Sheba (Isaiah 60:6; Jeremiah 6:20). When burnt it emitted a fragrant odor, and the incense was a symbol of the Divine name (Malachi 1:11; Song of Solomon 1:3) and an emblem of prayer (Psalm 141:2). It was often associated with myrrh (Song of Solomon 3:6, 4:6). A specially "pure" kind, lebhonah zakkah, was presented with the showbread (Leviticus 24:7). 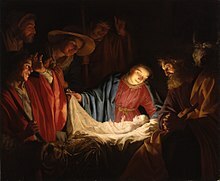 Frankincense also received numerous mentions in the New Testament (Luke 1:10; Revelation 5:8, 8:3). Together with gold and myrrh, it was made an offering to the infant Jesus (Matthew 2:11). The Greek historian Herodotus was familiar with frankincense and knew it was harvested from trees in southern Arabia. He reported that the gum was dangerous to harvest because of venomous snakes that lived in the trees. He goes on to describe the method used by the Arabs to get around this problem, that being the burning of the gum of the styrax tree whose smoke would drive the snakes away. Theophrastus mentions the resin, as does Pliny the Elder in his Naturalis Historia. "Ruxiang or xunluxiang comes from the three Dashi [Arab] countries of Murbat (Maloba), Shihr (Shihe), and Dhofar (Nufa), from the depths of the remotest mountains. The tree which yields this drug may generally be compared to the pine tree. Its trunk is notched with a hatchet, upon which the resin flows out, and, when hardened, turns into incense, which is gathered and made into lumps. It is transported on elephants to the Dashi (on the coast), who then load it upon their ships to exchange it for other commodities in Sanfoqi. This is the reason why it is commonly collected at and known as a product of Sanfoqi." Frankincense is used in perfumery and aromatherapy. It is also an ingredient that is sometimes used in skincare. The essential oil is obtained by steam distillation of the dry resin. Some of the smells of the frankincense smoke are products of pyrolysis. In Chinese medicine, it (ru xiang) along with myrrh (mo yao) have anti-bacterial properties as well as blood-moving uses. It can be used topically or orally. The Egyptians cleansed body cavities in the mummification process with frankincense and natron. In Persian medicine, it is used for diabetes. Frankincense is used in many Christian churches, including the Eastern Orthodox, Oriental Orthodox, and Catholic churches. According to the Biblical text of Matthew 2:11, gold, frankincense, and myrrh were among the gifts to Jesus by the biblical magi "from out of the East." Christian and Islamic Abrahamic faiths have all used frankincense mixed with oils to anoint newborn infants, initiates and members entering into new phases of their spiritual lives. The essential oil of frankincense is produced by steam distillation of the tree resin. The oil's chemical components are 75% monoterpenes, sesquiterpenes, monoterpenoles, sesquiterpenols and ketones. Contrary to some commercial claims, steam distilled frankincense oils do not contain the insufficiently volatile boswellic acids (triterpenoids), although they may be present in solvent extractions. The chemistry of the essential oil is mainly monoterpenes and sesquiterpenes, such as alpha-pinene, Limonene, alpha-Thujene, and beta-Pinene with small amounts of diterpenoid components being the upper limit in terms of molecular weight. Olibanum is characterised by a balsamic-spicy, slightly lemon, fragrance of incense, with a conifer-like undertone. It is used in the perfume, cosmetic and pharmaceutical industries. Müller, Walter W.: Weihrauch : ein arabisches Produkt und seine Bedeutung in der Antike, Realencyclopaedie / Pauly-Wissowa : Supp. ; 15, 1978, 700-777. "Frankincense" . Encyclopædia Britannica. 11 (11th ed.). 1911.